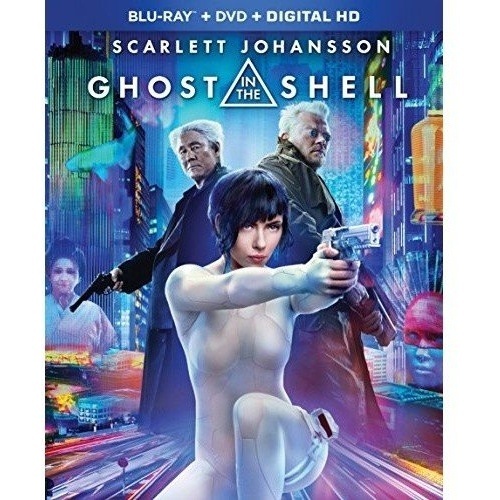 Ghost in the Shell is a key Blu-ray title released by Paramount Home Entertainment on July 25th, 2017. This science fiction action film was written by Jamie Moss, William Wheeler, and Ehren Kruger. The film is based on the Japanese manga of the same name by Masamune Shirow. The story is set in a near future, when the line between humans and robots is blurred, and a cyborg supersoldier seeks out her past. In the near future, a large number of humans are augmented with cybernetics, enhancing traits like vision and strength. Hanka Robotics, a leading developer of augmentative technology, establishes a project to develop a mechanical body that can integrate a human brain. Mira Killian is chosen as the test subject after her own body said to be damaged beyond repair. The Hanka CEO Cutter decides to employ the new and improved Killian as a counter-terrorism operative. A year later Killian has attained the rank of Major in the anti-terrorist bureau Section 9. She works alongside agents Batou and Togusa, under their Chief Daisuke Aramaki. However Killian experiences hallucinations that her designer Dr Ouelet dismisses as glitches, and becomes bothered by how little she remembers of her past. After Hanka employees are targeted by a terrorist known only as Kuze, Killian breaks protocol in her quest to root him out. However the expert hacker has even more tricks up his sleeve, including secrets that could change everything Killian has come to know as real. I was really looking forward to the Ghost in the Shell movie in the cinema, though the buzz was not so positive when the movie came out. It didn’t help that the casting of Scarlett Johansson in an essentially Asian role drew accusations of whitewashing. Not having seen the original anime or the manga, I figured that the movie would at least be a ‘gentle introduction’ to the story. Ultimately I found the film to be a mixed bag, where the visual style, including effects and set design, practical effects and action sequences where outstanding. The cinematography was imaginative throughout, though as the supplements revealed, was strongly influenced by that which came before. Sadly the human connection and the story fell somewhat flat though, making the my introduction to the Ghost in the Shell a little too gentle. Somehow the tension and energy you would expect from such a movie was quite lacking here, though it has given me the desire to seek out the anime version. To be fair, Ghost in the Shell is a pretty solid action piece, with visuals and action sequences that are at times mind boggling. However the idea of a live action version became so hyped that it was always going to be difficult to live up to it. Along with Scarlett Johansson, the cast includes Michael Carmen Pitt, Pilou Asbæk, Chin Han and Juliette Binoche. Ghost in the Shell was directed by Rupert Sanders, who was also behind Snow White and the Huntsman. The critical response to the film was at best middle of the road, with a Rotten Tomatoes score of 45%. It was met with more positive public response, earning an IMDb score of 6.6/10. Ghost in the Shell saw limited success in the cinema, taking in $40.5M at the US box office. Grossing $170 million worldwide against a production budget of $110 million, the film was no doubt a financial disappointment to the studio. The video on the disc is an AVC 1080p encode at 28.5 Mbps, and is presented at 1.78:1 aspect ratio, filling the HDTV screen. Visually the film is spectacular, and had me wishing I could view the 4K Ultra HD version with HDR. The cityscape was astonishingly bright, reminiscent of films like Blade Runner, but even bigger and wilder. Even with this Blu-ray release, the transfer features a solid capture of the imaginative cinematography and startling visual effects. For full resolution PNG screen captures taken directly from the disc, check out the details page for Ghost in the Shell. The main soundtrack is Dolby Atmos object based audio, which is backwards compatible with Dolby TrueHD. It is excellent to see the Atmos support on the regular Blu-ray release and not just confined to the 4K disc. The disc is a dual layer BD50, with 39.2 GB used and is coded for All Regions. The Blu-ray release for Ghost in the Shell comes with a small collection of supplemental features, though close to an hour of total run time. This featurette is a pretty extensive making of that runs for a half hour. The inspiration came from the manga and the anime version of the movie, right down to shots that match directly. The cast and crew talk about their contributions to the project. The shooting location in New Zealand and the approach by the Weta Workshop are revealed. The film involved a lot of specialized prosthetics and wardrobe choices. We also get a look at the practical special effects used in the shoot out and fight scenes. All in all this is a must see for fans of the movie. This segment delves into the mission of Section 9, the team that Major works for with the movie. These skilled operatives work together to fight cyber crime in the world of Ghost in the Shell. They also delve in to the voyage of self discovery of the main character of the Major. The philosophy behind the story and the main character is the key focus of this segment. The conflict of a character that is not sure if she is human or machine is the core of the story. This release also includes an UltraViolet Digital Copy code that can also be used for iTunes, and a DVD copy for legacy players. Ghost in the Shell is a mixed bag of a movie that features outstanding visual effects and action sequences. The Blu-ray release from Paramount Home Entertainment is technically excellent with solid visuals and Dolby Atmos immersive audio. Scarlett Johansson is terrific in the visually stunning Ghost In The Shell, an action-packed adventure set in a future world where people are enhanced with technology. Believing she was rescued from near death, Major (Johansson) becomes the first of her kind: a human mind inside an artificial body designed to fight the war against cyber-crime. While investigating a dangerous criminal, Major makes a shocking discovery – the corporation that created her lied about her past life in order to control her. Unsure what to believe, Major will stop at nothing to unravel the mystery of her true identity and exact revenge against the corporation she was built to serve. Packed with heart pounding excitement, see the movie critics are calling a classic in the making. This entry was posted on Monday, July 31st, 2017 at 7:39 pm	and is filed under Action, Atmos, Blu-ray, Commentary, Crime, Drama, Mystery, Paramount, Sci-Fi, Science Fiction, Thriller. You can follow any responses to this entry through the RSS 2.0 feed. You can skip to the end and leave a response. Pinging is currently not allowed.